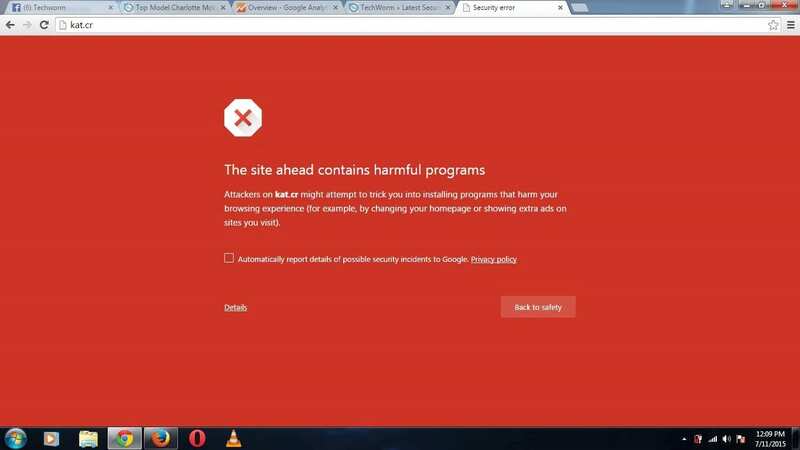 Google has started penalising torrent websites for reported ‘harmful programs.’ Starting if you try to access popular torrent websites like KickassTorrent, Torrentz, ExtraTorrent and RARBG, you will be greeted by the dreaded red window in Google Chrome stating that these sites have been blocked for carrying harmful programs. The twist in the plot is that none of these popular torrent websites know what they have done wrong. Also the users are at panic because they dont know whether to follow Chrome guidelines or disregard the message and move ahead to open the site. As stated above, Google doesn’t specify what the issue is with the sites in question. The “Safe Browsing” diagnostics pages only list the sites as “suspicious” and note that “third parties can add malicious code to legitimate sites.” in some cases. RARBG operator said that, “I hope Google comes to its senses and actually allows webmasters to see what the issue is in their webmasters tools.” One of the other sites, ExtraTorrent is also not aware of any issues with its site and does not know why Chrome is blocking. “There is no malicious software and you are still able to load ExtraTorrent in Mozilla Firefox, Opera, Chromium and other browsers,” the ExtraTorrent team says. “We’ll contact Google to resolve the issue shortly,” they add. However the all the proxy websites like torrentz-proxy.com are opening with the Chrome malware waring page. One of the reasons for triggering the malicious software warning may the unsafe ads which many torrent websites run. If you still want to access the above torrent websites, you can follow the tutorial by Chrome here to disable the Chrome malware warning. I am able to open the kickass website on Google Chrome. how to open it on google chrome? Firefox is doing the same. With Safari everything is OK. This is also occurring on streaming sites. It started just over a month ago. Google sleeps with the MPAA, so this really isn’t surprising. Open preference and click disable malware that it! But I m no longer Chrome because high ram pretty selfish by Google. https://torrentkat.com works fine for me and has encryption for your privacy.